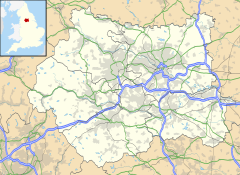 Esholt is a village between Shipley and Guiseley, in the metropolitan district of the City of Bradford, West Yorkshire, England. It is situated 4 miles (6.4 km) east of Shipley, 4 miles (6.4 km) south-west of Guiseley, 5 miles (8.0 km) north of Bradford, and 12 miles (19 km) north-west of Leeds. The name "Esholt" indicates that the village was first established in a heavily wooded area of ash trees. In the 12th century, the Esholt estate was owned by Syningthwaite Priory, and Esholt Priory, a Cistercian nunnery dedicated to St Mary and St Leonard was established at Lower Esholt. When the nunnery was dissolved in about 1547 the estate was granted to Henry Thompson by Edward VI. In the 17th century Frances Thompson, the heiress of Henry Thompson married Walter Calverley (1629–1694). In 1709 their son Walter Calverley built Esholt Hall, a Queen Anne style mansion house, on the site of the old nunnery. In 1775 the Calverleys sold the estate to Robert Stansfield whose family remained in possession until 1906 when it was sold to Bradford City Council. To the north of the village was Esholt railway station opened in 1876 and closed in 1940. In 1892 a notable rail crash occurred nearby at Esholt Junction on the Otley and Ilkley Joint Railway. From 1912 to 1915 Nanson, Barker & Co manufactured the Tiny cyclecar in Esholt. In 1919 after the First World War the company made larger cars under the Airedale brand but went into liquidation in 1924. Just before the First World War land on the estate was used for Airedale Aerodrome. The current owner of the estate, Yorkshire Water, operates a waste water treatment plant on what was the location of the aerodrome. Home farm on the estate is used as a conference and staff learning centre and many buildings have Grade II star listed building status. The manor house, Esholt Old Hall at Upper Esholt is medieval in origin, probably 16th century, and possibly once had a moat. It is well-preserved and has Grade II* listed building status. Esholt has two public houses, The Woolpack* in Main Street and The Old Barn. The Church of Saint Paul was built at a cost of £800 in 1839 by William Rookes Crompton-Stansfield for use as a private family chapel. Historically part of the parish of Guiseley, the Church of St Paul is a successor to the private chapel in the old manor house. It was consecrated in 1853 and the chancel added in 1895. Since 1983 it has been in the combined parish of Guiseley with Esholt. There are many listed buildings on Esholt Lane, Cunliffe Lane, Chapel Lane, Church Lane, Main Street, St Leonard's Farm, Upper Esholt, The Avenue, and Esholt Hall. Esholt Waste Water Treatment Works is located on a 300 acres (120 ha) site on the former estate of Esholt Hall, and serves 750,000 people in Bradford and North Leeds. It is Yorkshire Water's second largest waste water treatment plant, exceeded only by Knostrop in Leeds. As Bradford's population and the textile industry grew in the early 19th century most human waste and industrial effluent drained into Bradford Beck, to the canal basin and on to the River Aire flowing past Esholt. In 1862 a sewage system was begun in Bradford but Bradford Beck was still polluted. In 1869 William Stansfield of Esholt Hall obtained an injunction requiring Bradford Corporation to improve the sewage system so as not to pollute the beck. Bradford Corporation built a treatment works at Frizinghall to treat sewage before the water was put in the river. When Frizinghall works could not cope with the waste the Esholt estate was acquired for more than £239,000 as the site for a new sewage works. A three-mile long tunnel between Frizinghall and Esholt to connect the sites was completed in the 1920s. Frizinghall works closed in 1926. The tunnel has ventilation shafts in Frizinghall, Wrose and Idle. In the site's Sludge Disposal Building later known as the Press House, 128 steam filter presses compressed sludge to recover grease (lanolin) which could be used for a variety of applications, and the press residue was sold as fertiliser to meet the cost of operating the plant. After Bradford's woollen textile industry declined, the Press House became roofless and derelict. Between 2006 and 2009 the waste water treatment plant was modernised. The £44m scheme included the installation of aeration tanks, activated sludge tanks, and sludge digestion facilities. The sludge digestion facility produces biogas that is used in a combined heat and power plant with two CHP engines generating 19 MWh per day which is 44% of the electrical energy requirements of the site. Waste products from the works are reprocessed, mixed with green waste and turned into compost. The old percolating filters are obsolete and there are plans to empty them and install photovoltaic panels to generate electricity to power the site, with any excess going to the National Grid. The effluent emerging from the sewage tunnel passes through motorised screens, then through the 64 tonne Spaans Babcock screw generators into the primary settling tanks. The screw generators comprise two 2.6 metres (8.5 ft) diameter, 14 metres (46 ft) long Archimedes' screw hydro-turbine generators installed in series. The generators operate on a head of 8.2 metres (27 ft) with a flow rate up to 2,678 litres per second, generating up to 175 kW, providing 7% of the electrical power required by equipment on the site. The equipment was installed in 2009 by JN Bentley and is the first site in the UK to use untreated (screened) sewage for hydro power generation. Esholt Cricket Club and a running club are based at Upper Mill Cottages on Esholt Lane. Also, on Esholt Lane is a golf driving range and near Hollins Hall Hotel an 18-hole golf course. The 649 bus service to Shipley stops in Esholt. The nearest railway stations are at Shipley, and Guiseley on the Wharfedale line. From 1976 to 1996 Esholt was used for outside location shots for the Yorkshire Television drama series Emmerdale Farm. The series relocated to a purpose built set based on the layout of Esholt on the Harewood estate in Leeds. During the time when the village was used as a location, the name of the village pub was changed from The Commercial Inn to The Woolpack when the landlord tired of the inconvenience caused by the frequent pub sign changes. Scenes were once again filmed in Esholt, 19 years after they were last filmed, as part of the special episode following Ashley Thomas's dementia storyline in December 2016 in an attempt to show a skewed, unfamiliar view of the village as perceived by Ashley. Sir Walter Calverley (1670 – 1749) lived at Esholt Hall which he had built in 1709. His son Sir Walter Calverley-Blackett (1707 – 1777) lived at Esholt Hall before his marriage. The mill owner Sir Henry Mitchell (1824-1898) was born in Esholt and received a knighthood for his support and service to education in Bradford. ^ a b Garnett, Breedge (September 2002). "Esholt: A suitable case for treatment! (1)". BBC Home. Retrieved 2 October 2011. ^ a b c d Hinson, Colin (29 May 2011). "The Parish of Guiseley". GENUKI. Retrieved 14 December 2012. ^ "Esholt". Monastic Matrix. Retrieved 16 October 2013. ^ a b Garnett, Breedge (September 2002). "Esholt: A suitable case for treatment! (3)". BBC Home. Retrieved 2 October 2011. ^ "1850 to 1899". Bradford Timeline - History of Bradford, Yorkshire. Retrieved 25 September 2013. ^ Hutchinson, Maj Gen CS (6 July 1892). "Report on the Accident at Esholt Junction" (PDF). Board of Trade. Retrieved 11 January 2009. ^ Baughan, Peter E (1969). The Railways of Wharfedale. David & Charles Ltd. ISBN 0-7153-4705-5. ^ Georgano, Nick, ed. (2000). Beaulieu Encyclopedia of the Automobile. London: HMSO. ISBN 1-57958-293-1. ^ Appleby, Jim (20 May 1998). "Jim Appleby: Past Times". Telegraph and Argus. Retrieved 20 March 2016. ^ Johnson, Graeme. Yorkshire Millennium Factbook. ISBN 1-85568-168-4. ^ a b "Esholt Hall with Terrace and Adjoining Conservatory". British Listed Buildings. Retrieved 12 September 2011. ^ "Pubs in Esholt". Pubs Galore. Retrieved 26 September 2013. ^ a b "St Pauls Church, Esholt". Parish of Guiseley with Esholt. Retrieved 25 September 2013. ^ "The Ancient Parish of Guiseley". GENUKI. Retrieved 29 October 2007. ^ "St Paul's Church". guiseleywithesholt.org.uk. Retrieved 30 March 2013. ^ "Gill Beck Farmhouse". , "Upper Mill Cottages". , and "22 and 24". Esholt Lane, British Listed Buildings. Retrieved 29 September 2013. ^ "1". , "Bunkers Hill". , "Cunliffe House". and "Barn". Cunliffe Lane, British Listed Buildings. Retrieved 29 September 2013. ^ "1, 3 and 5". , "Holme House". , "Upper Esholt Farm Mistal and Barn". Chapel Lane, British Listed Buildings. Retrieved 29 September 2013. ^ "2-8 even". , "10". , "14 and Smithy". , "Esholt Old Hall and Barn". , "Vicarage". , "Sexton's Lodge". , "Church of St Paul". Church Lane, British Listed Buildings. Retrieved 29 September 2013. ^ "3-11". , "6 and 8". , "10-18". , "13-21". , "22, 24 and 26". , "23". , "28". , "Memorial Institute". , "The Woolpack". , "Telephone Kiosk". Main Street, British Listed Buildings. Retrieved 29 September 2013. ^ "Farmhouse". , "Barn". , and "Mistal". St Leonard's Farm, British Listed Buildings. Retrieved 29 September 2013. ^ "High View: High View House". , "2". , "3, 4". British Listed Buildings. Retrieved 29 September 2013. ^ "Boggart House". , "Home Farm Farmhouse". , "Farm Building". , "Farm Cottage". , "Barn". , "Range, Outhouses, Cow Shed, Cart Shed". , "Stable, Tack Room, Hay Loft, Cow Shed". , "and Barn". The Avenue, British Listed Buildings. Retrieved 29 September 2013. ^ "Esholt Hall, Terrace, Conservatory". , "Outbuilding". , "Park Cottages Stable Coach House Range". , "Laundry". , "Kitchen Garden Wall". , "Park Cottages Stable Coach House Range". , "Northern Gate Piers". , and "Gate Piers in Park". British Listed Buildings. Retrieved 29 September 2013. ^ a b c d "Renewable Energy Scheme: Esholt". JN Bentley Ltd. 2011. Retrieved 2 October 2011. ^ a b c d "Esholt Waste Water Treatment Works". Morgan Sindall. Archived from the original (PDF) on 24 October 2013. Retrieved 2 October 2011. ^ Garnett, Breedge (September 2002). "Esholt: A suitable case for treatment! (2)". BBC Home. Retrieved 2 October 2011. ^ Spencer, David (8 July 2005). "Shaft for Frizinghall to Esholt sewage". Geograph. Retrieved 17 October 2013. ^ Spencer, David (7 July 2005). "Shaft for Frizinghall to Esholt sewage". Geograph. Retrieved 8 February 2014. ^ a b Garnett, Breedge (September 2002). "Esholt: A suitable case for treatment! (4)". BBC Home. Retrieved 2 October 2011. ^ a b c "Esholt WwTW - Pioneer of Sustainability". Yorkshire Water. Archived from the original on 21 October 2013. Retrieved 16 October 2013. ^ a b "Hydro Power using Waste Water at Esholt WwTW". Spaans Babcock. 2010. Retrieved 2 October 2011. ^ "Esholt Cricket Club". Esholt Sports & Leisure. 2011. Archived from the original on 1 September 2006. Retrieved 2 October 2011. ^ "The Old Barn At Esholt". restaurants. Archived from the original on 21 October 2013. Retrieved 2 October 2011. ^ "Bus Service 649". West Yorkshire Metro. Retrieved 17 October 2013. ^ a b "Filming locations for Emmerdale". IMDb. Retrieved 12 December 2012. ^ Kilkelly, Daniel (20 December 2016). "Emmerdale: Did you notice the show returned to its old village in the Ashley episode?". Digital Spy. Retrieved 8 January 2017. ^ "Sir Henry Mitchell". 175 Heroes. Retrieved 7 October 2013. Wikimedia Commons has media related to Esholt. Wikimedia Commons has media related to Esholt sewage works. This page was last edited on 6 February 2019, at 18:21 (UTC).